posted by calgarygrit at 4:35 p.m.
Is she also helping Brendan Shanahan with reviewing NHL play-off infractions? By Robert Vollman, at 6:07 p.m. I believe in free speech and I would sacrifice my life for it. But in this case here it’s not free speech it’s pure hatred and bigotry. These sort of comment suggesting that whites are supposedly superior and have an advantage have no place in our multicultural society of Canada and have no place in the public or especially political form. This candidate should be charged with promoting hatred and forced to withdraw for the election. By Anonymous, at 9:29 p.m.
Did you bother to check what he was responding to? The interviewer asked him whether being white was a disadvantage when running in a heavily ethnic riding, because he would be seen as only reaching out his own race - a stupid assumption. 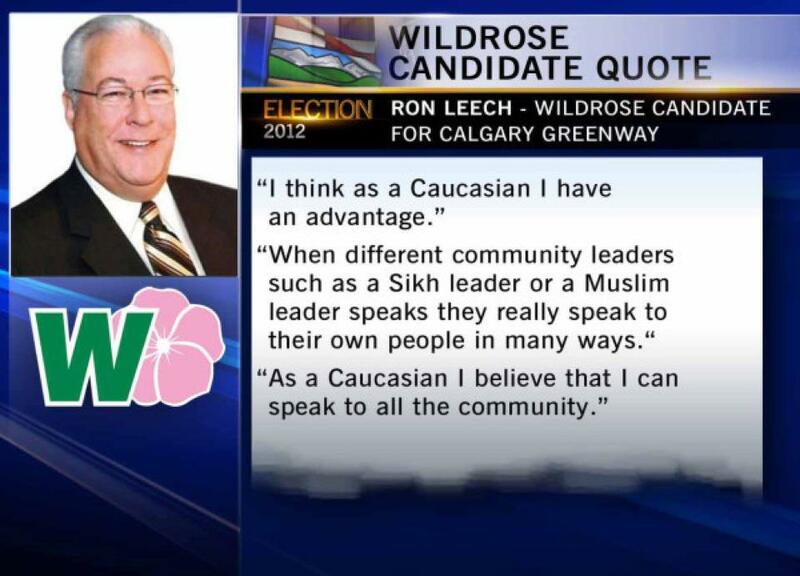 Leech pointed out (inelegantly) that the same could just as easily be said of a Sikh or Muslim candidate, and that a white person is just as capable of "speak[ing] to all the community" as anyone else. And if saying that being white gives him an advantage in certain cases makes Ron Leech a racist, then you must also think anyone who talks about white privilege is also racist... right? By Manjit, at 11:24 p.m.
What Leech said was paternalistic, dumb and definitely politically inept. However, your histrionics are WAAAAY over the top. He very clumsily was trying to make an argument about any number of long-standing disputes between various ethnic and/or religious groups. Attempting to make that argument showed him as not ready for public service and deserving to lose the election. Did you even read his comments? Pure hatred? Nothing of the sort. It's reactions like yours that lead to many of the plurality of Albertans supporting the Wildrose, for among other reasons, the Wildrose's opposition to the Alberta Human Rights Commission. Leech will get what he deserves, he will lose the election and has ended any chances he ever had of a political career. What exactly should he be charged with? Stupidity? By Scoopie, at 11:29 p.m.
Bozo Bond, I think is the term. By Bozo Bond Jumper, at 11:32 p.m.
Obviously not the most politically astute response. Moreover, given that whites conquered the ancestors of many non-Caucasians, probably not true. That said, I figure that in your typical white supremacist forum, you don't have a bunch of people declaring that whites are the master race, based on their superior ability to foster cross-cultural dialog. By hosertohoosier, at 3:05 a.m.
By Herbert B. Patrotage, at 7:30 a.m. I guess it does not matter that Rasheed said exactly the same thing, the other commenters here will not listen to evidance put right before them. That is the same reason the Federal LIEberals is lower than the NDPQ. Jusl like the LIEberal [87% of Canadians did not vote for them] and NDPQ hate Harper, these same people hate WildRose Party - no matter wat they say - go figure. Anonymous (9:25) said... "But in this case here it’s not free speech it’s pure hatred and bigotry. These sort of comment suggesting that whites [and Muhammad Rasheed] are supposedly superior and have an advantage have no place in our multicultural society of Canada and have no place in the public or especially political form. This candidate [and Muhammad Rasheed] should be charged with promoting hatred and forced to withdraw for the election." By price per head, at 1:26 p.m.
By raybanoutlet001, at 11:26 p.m.
فقد تم مران وجميع العمال والفنيين من قِبل المؤسسة علي اجدد الأجهزة والأوناش وعلي أساليب النقل الصحيحة إلى تحافظ علي سلامة وأمان جميع العفش دون حدوث أي خسائر أو تلفيات. By Ahmed Hamdy, at 3:55 a.m.